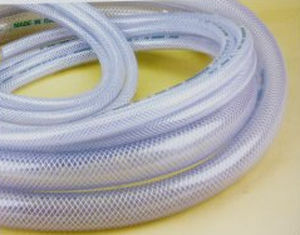 Plasticized PVC hose with polyester yarn reinforcement. Product for both non-toxic according to the MD 21/03/73 and subsequent updates, EEC directive and changes. Color: clear transparent. Operating temperature: -10° to +50 °C. Application: liquid flow in general industry, chemical solutions, drinking water, foodstuffs, coolants, compressed air.